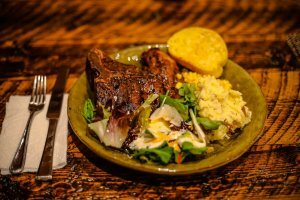 After shooting your Kansas Trophy Whitetail, you can try this great recipe! In a gallon-sized, sealable plastic bag, combine the venison, water, salt, bay leaves, black pepper and garlic powder. Seal and place in refrigerator overnight. Do not leave in brine for more than 24 hours. Prepare and preheat grill. Wrap venison steaks with a half or a full-sized piece of bacon, depending on the size of the steak. Secure bacon with a toothpick by stabbing it through the entire piece with a little toothpick piece sticking out both sides. Grill until bacon is crispy. As always, do not grill venison too long or it will dry out. Serve with your favorite barbeque or steak sauce. NOTE: I prefer to grill these on a charcoal grill, and I add a small handful of applewood chips (presoaked in water for 30 min.) to the coals right before grilling to add a smoky flavor too.